Many people assume there is little wild food to be found in the winter months, but if you know what you are looking for there are still some tasty pickings to be had. Though the choice may be more limited it is still great fun to explore the apparently bare landscape and see what survives the cold dark days of winter. Foraged foods can be great for your health as well – at a time of year when the cold creates cravings for fatty comfort food wild greens can provide you with an extra boost of nutrition that you may be missing. Wild plants are generally far richer in micronutrients than their cultivated cousins, and I like to think the ones that can survive the hardship of the winter months must be especially rich in beneficial phytochemicals. Most of what is on offer is of the leafy variety – some are great for salads while others can provide a regular supply of cooked greens. Here I cover five of my favourite wild winter greens to keep you going through the last leg of winter. This is possibly the hardiest wild green that can be foraged for in winter – I remember a particularly cold winter around five years ago we would go out with snow shovels and find ox-eye daisy still surviving beneath several inches of snow. You can find large patches of it in parks, along roads and on the edges of fields. Much easier to spot when it is in full flower – so prepare for winter by taking note of where it grows during the summer. It has a unique flavour that I really enjoy but always struggle to describe, and it is well liked by everyone when they taste it on my foraging courses. I use it mainly as a salad, but it also makes a good green if blanched or steamed briefly to retain the flavour. This hardy little plant can survive through the frosts, so much so that when I worked supplying wild food to restaurants we would pick it first thing in the morning as it was one of the few plants that would not wilt and turn to mush by the time we got it back to the store. As it can be quite fiddly to gather, picking without gloves was the quickest way, and we would often end up with numb fingers after the hour or two it would take to collect the weeks harvest. The leaves grow in rosettes that stay flat on the ground in the winter. It is easy to pick if you snip the middle of the rosette with scissors just where it joins the root. 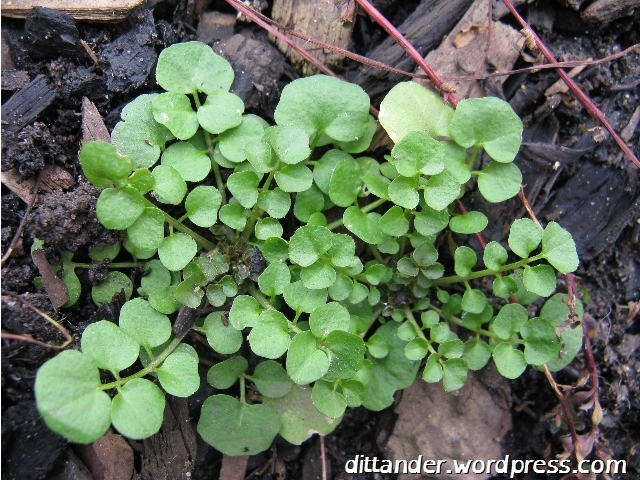 It is commonly found on bare ground in flowerbeds, and if you have any gardening friends they are likely to be quite happy for you to remove it as it can quickly take over; a single plant is capable of producing thousands of tiny seeds. The taste is peppery and it provides a satisfying salad leaf that goes well with foods traditionally paired with watercress such as beetroot and beef. The mustard oils that give it its spicy flavour break down on cooking though so best eaten raw. Although this plant originates from the Mediterranean it can grow throughout the British winter. Apparently named after Alexandria, it was introduced by the Romans and is now quite at home across the British isles, though concentrated more in the South. It is mostly found along the coast, but it does appear inland occasionally. 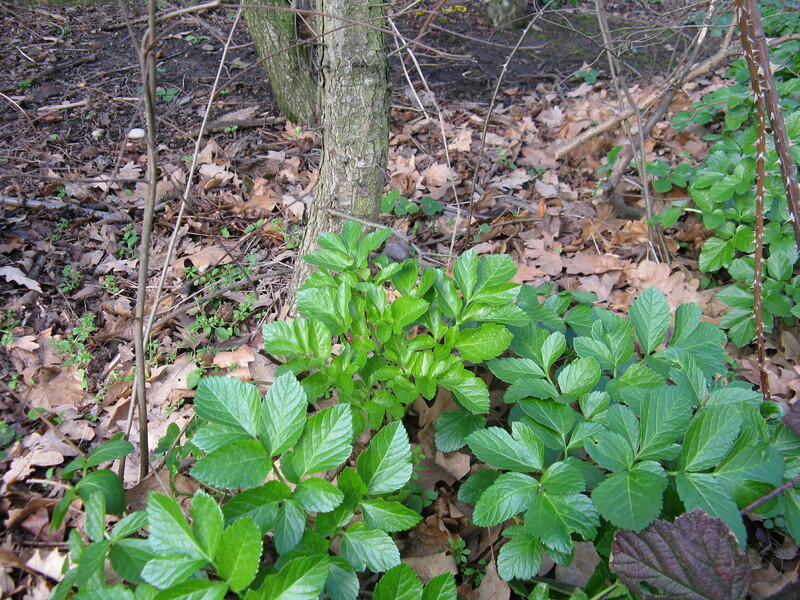 Alexanders often grows in large bunches giving you much more weight per picking time than bittercress, and even during winter it can grow several feet high. The strong, aromatic flavour can be a surprise to some, but can be tempered by longer cooking. Use like celery for soup stocks and sauces, or steam and serve in butter as a vegetable. Like celery it is generally best to strip the leaves from their stalks and cook separately, with the leaf being more of a herb once you get a taste for it. The stalks may need peeling as they can be stringy. It is often paired with seafood because of it’s coastal associations. When most people talk of wild garlic they are generally referring to ramsons (Allium ursinum), however there are many more species that grow native in the UK. One of the first to emerge is three cornered garlic, named for the structure of its long, smooth leaves that becomes clearer when sliced into cross-section. 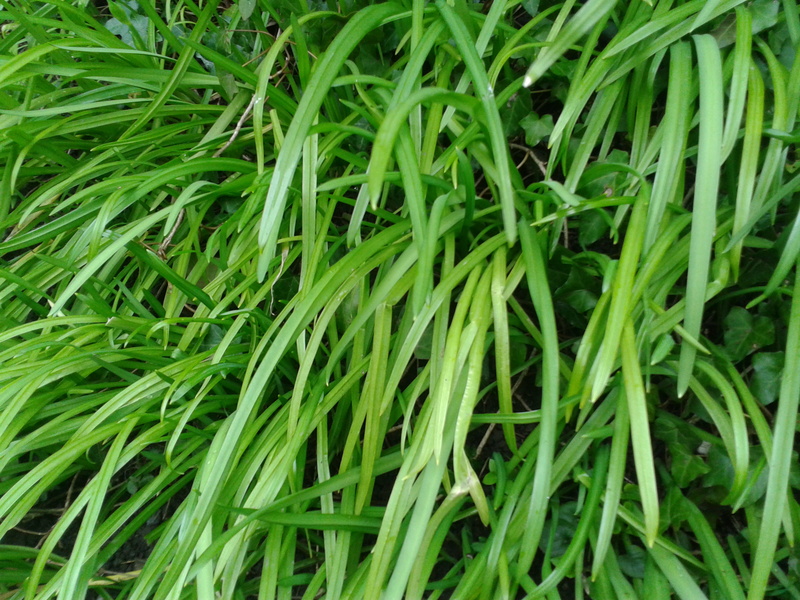 Also known as three cornered leek, it can be found in large enough quantities to be cooked as vegetable, with the garlic flavour dissipating the longer it is cooked. It is delicious in cheese sauce with pasta or fish. It can be used the same way as ramsons in any recipe, and makes a great pesto that should help keep the colds away in winter. I normally see it around churches, along rivers and the edge of woodland. I also often spot it in front gardens, though care must be taken not to confuse it with poisonous members of the lily family. This is probably my favourite wild green – I find it satisfies like few others and I loved discovering that some thistles can be eaten. The bitterness is similiar to radichio and chicory (cultivated relatives in the daisy family), though it has a more substantial texture when cooked than these two, lending it well to use in pastries and pies. The spines soften when cooked, though some may be so tough they need removing. It is delicious simply blanched then stir fried in oil, garlic and chilli. The most succulent part is the midrib close to the centre of the rosette, and these can be eaten raw. Prickly sow thistle grows in abundance on agricultural land over winter, however this means great effort goes into eradicating it – so make sure you check the field hasn’t been sprayed before picking. 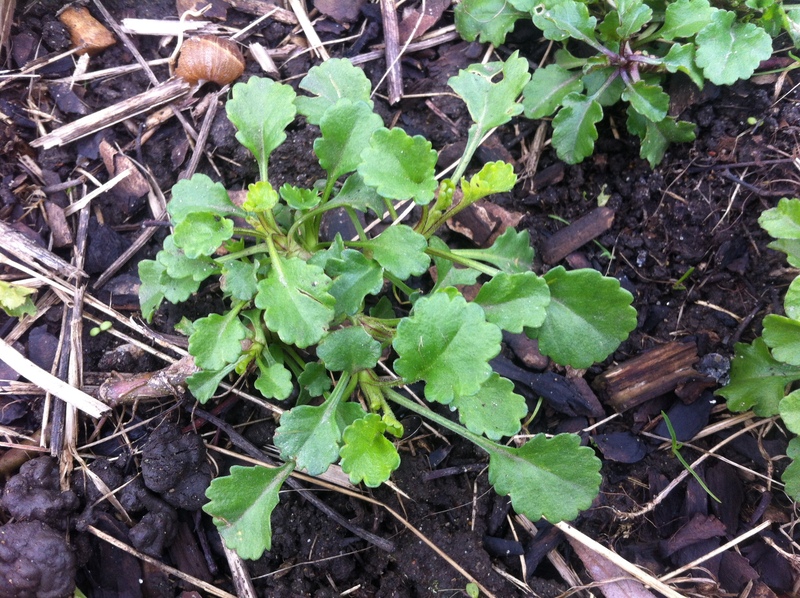 It can also be found in smaller patches on allotments and in flower beds. 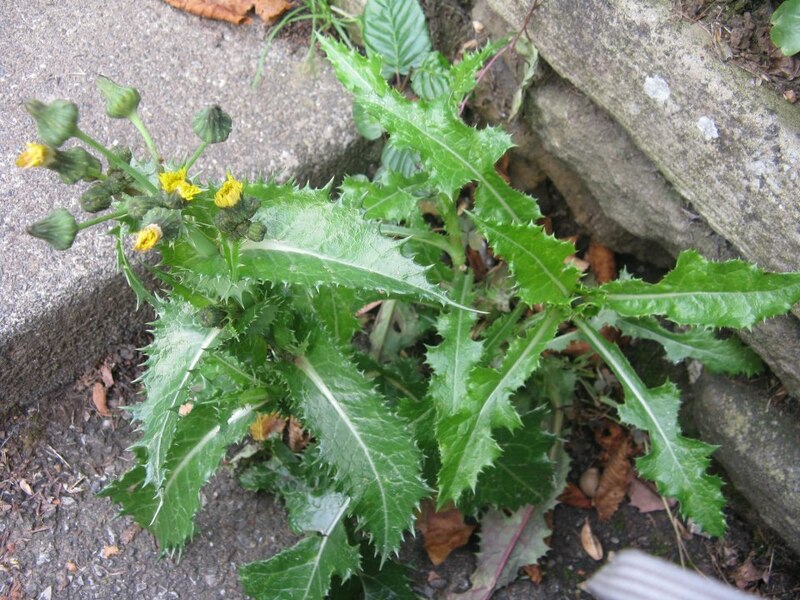 In urban environments you are more likely to see it’s softer relative smooth sow thistle (Sonchus oleraceus), which can be eaten raw without having to worry about avoiding prickles. These are just some of the many edible wild plants you can find when foraging in winter in the UK, and I have only touched on some of the many ways they can be used in the kitchen. Other greens to look out for are: mallow, bristly ox tongue, dandelion as well as cleavers and chickweed if it hasn’t been frosty. From the coast there is sea purslane, sea radish and wild cabbage. There are also a few herbs around towards the end of winter – cow parsley, crow garlic and wild fennel. While I’m out searching for these tasty plants I’ll be keeping an eye out for the first signs of spring – blackthorn blossoms providing a splash of white on a grey landscape, the bright green buds of hawthorn slowly unfurling and curled tips of ramsons clustered together on the forest floor. And before I know it the choice of wild foods will soon be almost overwhelming, and a little bit of me may even miss the simple selection of winter.